Cholesterol can't dissolve in the blood. It has to be transported to and from the cells by carriers called lipoproteins. Low-density lipoprotein, or LDL, is known as "bad" cholesterol. High-density lipoprotein, or HDL, is known as "good" cholesterol. 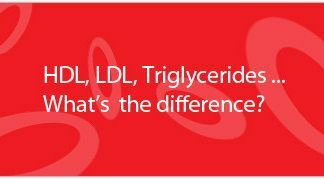 These two types of lipids, along with triglycerides and Lp(a) cholesterol, make up your total cholesterol count, which can be determined through a blood test. About one-fourth to one-third of blood cholesterol is carried by high-density lipoprotein (HDL). HDL cholesterol is known as "good" cholesterol, because high levels of HDL seem to protect against heart attack. Low levels of HDL (less than 40 mg/dL for men and less than 50 mg/dL for women) also increase the risk of heart disease. Medical experts think that HDL tends to carry cholesterol away from the arteries and back to the liver, where it's passed from the body. Some experts believe that HDL removes excess cholesterol from arterial plaque, slowing its buildup.